Hafid’s Grand Bazaar immerses you in the bustle of a thriving marketplace. Bid on caravans, negotiate with other merchants, sell your wares, and amass the most wealth to become the greatest trader in the land! The game is played in a series of rounds consisting of four phases: Bidding, Caravan, Trading, Selling. You play enough rounds for each player to have a chance to be the first player once (twice for a 2-player game). Collect sets of goods from five categories (Food, Textiles, Livestock, Raw Materials, Finished Goods) with five unique goods in each category to appease your customers. Other merchants can see the category of goods in your hand (back of the cards), but do not know which specific goods you have within that category (front of the cards). Players take turns placing bidding cubes on various market segments to gain access to Caravans (provide additional goods from Foreign Markets), Customers (allow you to sell specific set types for scoring), or Influence (provide access to information or extra Merchant cards). Players bid on the order in which these caravans are claimed (1st Choice, 2nd choice, etc. as indicated by the numbered circles at the center of the board), not specific cities. Players CAN be outbid on caravans. Bidding ends once all players have placed all of their bidding cubes in play. If you are outbid on a Caravan or the Informant, you do not get your cubes back until the next Phase. Players claim Foreign Markets and Influence based on their bids in the previous phase. The winning bidder on the Informant space chooses to view the cards from a single city or a single Merchant card category in the Foreign Markets, then draws 1 card from the discard pile or draw pile. Next, beginning with the 1st space in the Caravans, winning bids choose the caravan they want from ANY of the remaining Foreign Markets. If players were outbid, they do not choose a caravan, and instead take the top card from the draw pile. While caravans are being claimed, players may activate their Free Trade bid to draw the top 2 cards from the draw pile. Players retrieve their bidding cubes as they claim Caravans and their Free Trade bids. Once all cubes have been retrieved from the Caravan and Free Trade spaces, the Caravan Phase ends. Players haggle with other merchants to obtain the goods they need to complete sets for their customers. You cannot lie or steal, and you MUST honor your deals. Only players who bid on the Negotiator may initiate trades. Multiple players can bid on the Negotiator. Players who did NOT bid can only trade with a player who did. Negotiators can facilitate trades for other players and are permitted to charge a surcharge for the service. Trading is wide open and NOT limited to cards. You can trade for information, access to customers, even the last slice of pizza or a ride to the airport! A Negotiator ends trade by removing their cube from the Negotiator space. Once all cubes have been removed the Trading Phase ends. Players now sell their wares to customers. There are 3 customer types looking for different types of sets: Haggler, Collector, Guild Master. You can sell multiple sets to each customer and sell to more than one customer. If you cannot complete a customer set (or did not bid on a customer) you may sell up to 10 cards for their face gold value. This is called Plying Your Wares. Collect gold Talents for the sales you were able to make and add them to your scoring pile. The Merchant with the highest total Talent value at the end of the final round wins! There is little downtime as all players are engaged in all phases of each round and you will want to be paying attention to the trades going on around you for clues as to what each player is planning to sell. Creative negotiation is highly encouraged and table talk can get raucous. Download a copy of the Rules and get ready to haggle! 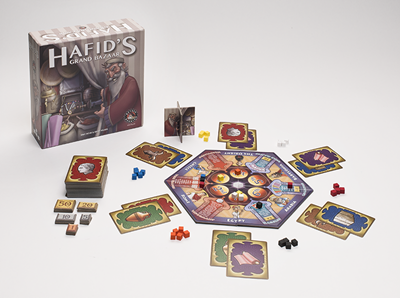 Hafid’s Grand Bazaar is available October 4, 2017 at your Friendly Local Game Store! Element Promo Cards Now Available! The promo card packs that came with Element during the pre-order phase are now available through the Boardgamegeek Store! These sets include 4 cards, each depicting a different color sage as a reminder of which sage you are trying to capture in three- and four- player games. Remember: if you capture the wrong sage, you’ve won the game for another player! The background of the cards also features a visual reminder of the Rule of Replacement. This rule allows you to replace each element in play with a different element stone in a specific order. One more helpful way to help you master of the elements and gain victory over the other sages. Order a set for your favorite Element player! Element is available at your Friendly Local Game Store and in our web store!